How Do You Use Unit Rates to Compare Rates? Word problems allow you to see the real world uses of math! 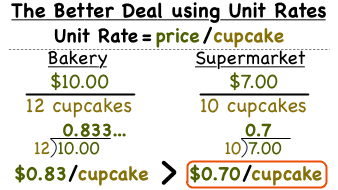 This tutorial shows you how to use ratios to figure out which store has a better deal on cupcakes. Take a look! Understand the concept of a unit rate a/b associated with a ratio a:b with b ≠ 0, and use rate language in the context of a ratio relationship. How Do You Convert a Rate To A Unit Rate? When you talk about the speed of a car, you usually say something in miles per hour. For example, you say, 'I drove 40 miles per hour.' Normally, you don't say, 'I drove 120 miles per 3 hours.' Figure out how to convert a rate like 120 miles per 3 hours to the unit rate of 40 miles per hour by watching this tutorial. Solve unit rate problems including those involving unit pricing and constant speed. How Do You Solve a Word Problem Using Unit Rates? Word problems allow you to see the real world uses of math! This tutorial shows you how to take a rate and convert it to a unit rate. Then, you can use that unit rate to calculate your answer. Watch this tutorial to learn all about it!